Dimensions (HxWxD): 1.10" x 0.55" x .375"
This lovely, pale Rose Quartz Mini Magician Stone Pendant with large trillion cut Iolite gemstone crown, offers tremendous protection & connection to the Higher Self. It is set into a sterling silver setting which allows the stone to breath, and hangs on its sterling silver chain right on the thymus between the throat and the heart chakras, offering protection to the whole body resonating through the compassionate heart. The Magician Stone pendant is cut according to principles of sacred geometry so that a star exhibiting four-fold symmetry appears within it. One can see other stars refracted within the star as well. The magician stone cut provides for centering and grounding the bearer's energy while opening the heart and mind to inner spiritual guidance. The combination of Iolite and rose quartz helps open the channels between mind and heart, providing the bearer with joy, inspiration, sharp intuitition, and warm intellligence. The equilateral cross symbolizes the Tetrahedron. The Tetrahedron, or four-sided pyramid, is the geometrical principle underlying many types of both organic and inorganic molecules, and provides the microscopic structure of diamonds and of the amino acids that are the building blocks of all life-forms on planet Earth. Thus it is no surprise that the equilateral cross is an ancient symbol of the Mother Goddess, and represents the four elements of earth, air, fire and water and the four directions of the compass. The Magician Stone cut pendant is designed to bring the wearer into harmony with the four elements and the four directions, and to help harmonize your energy field with the cosmic flow of energy pouring from from the Mother Goddess and present throughout all creation. 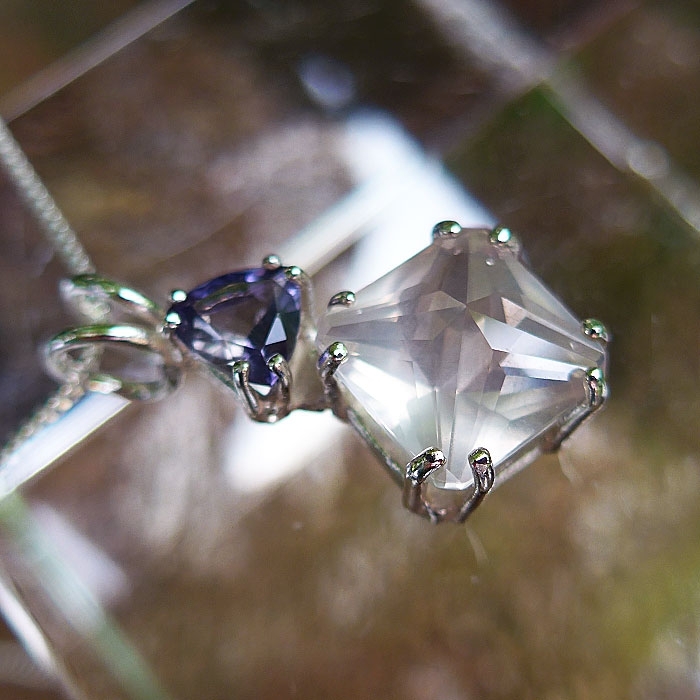 Iolite is an extremely hard orthorhombic gemstone -- much harder than quartz crystal. Iolite commonly exhibits a brownish, blue color, and the more violet shades, such as you see in this specimen, are more desirable. The word "iolite" comes from the Greek meaning "violet stone". Iolite is considered to resonate with a very high frequency energy signature, which corresponds to the violet color of the crown chakra in the Western chakra system. 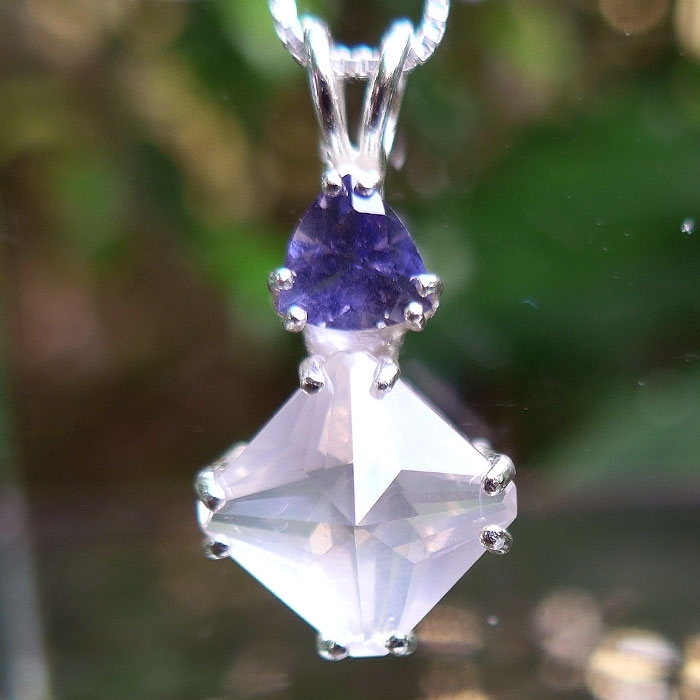 Thus Iolite is considered to be one of the premier gemstones for opening the third eye and crown chakras, and is said to stimulate clairaudience, clairsentience, and clairvoyance. Iolite is also considered to be a stone useful in astral travel and shamanic journeying. 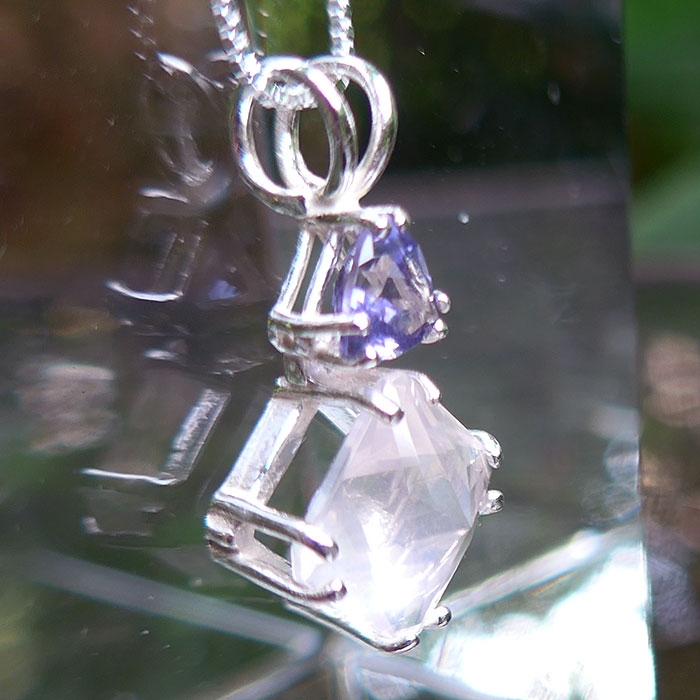 In addition, Iolite is said to harmonize the male and female aspects within the bearer, to equilibrate the right and left hand sides of the brain, and to facilitate the harmonious expression of love within committed relationships. Rose Quartz is perfect for anyone who needs extra emotional support. It imparts a deep & warm pink glow which offers soothing energies to provide you heart's ease. It is a wonderful tool to assist in opening the heart during meditation sessions. Rose quartz projects a soft, soothing, gentle energy that resonates with vibrations of love, and is especially supportive in cases where an individual is developing the capacity for self love. It sends out an energy of unconditional love, as compared with passionate love, so the energy of rose quartz resonates with the heart chakra rather than the lower chakras. This is a gently healing stone, allowing for the slow opening of the heart to healing and loving energies. It supports the wearer or bearer of this stone in all spiritual practices and daily activities that promote the development of compassion for all beings -- and especially for oneself. Rose quartz has often been used in the treatment of wounds to the emotional body, and especially a wounded heart, but can be used effectively in treatment of wounds to the heart, throat, third eye and crown chakra. We often recommend that our Reiki and past life therapy clients wear crystals or gemstones for protection, to assist in working on all of one's bodies: physical, mental and emotional. 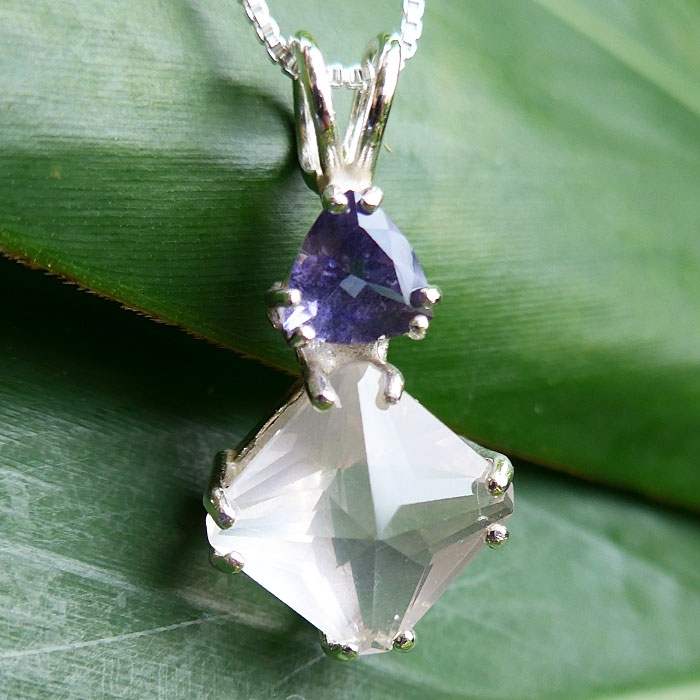 We know you will use this powerful crystal with loving care and respect its long evolutionary journey deep in the Earth, which has developed its unique metaphysical properties and beautiful appearance. Read more about quartz and other types of crystals at the SatyaCenter.com Crystalpedia. Check out our FREE e-book Spirits of Stone: A Lightworker's Guide to Crystals and Gemstones for Healing and Meditation for an overview of the metaphysical and mineralogical properties of quartz, and a step-by-step guide explaining how to cleanse, charge, and program quartz crystals for healing, meditation and other spiritual purposes. Note: Weight above is shipping weight. Actual weight of this pendant is 4.2 grams or .150 oz. Each piece is unique and may vary slightly from photo above. Each piece is guaranteed to be beautiful and to meet with your complete satisfaction!